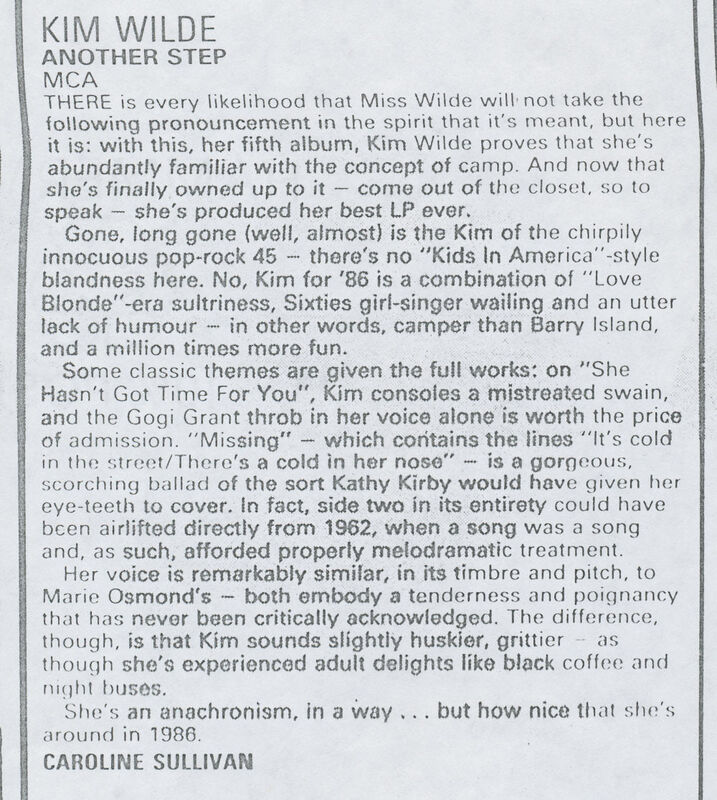 There is every likelihood that Miss Wilde will not take the following pronouncement in the spirit that it's meant, but here it is: with this, her fifth album, Kim Wilde proves that she's abundantly familiar with the concept of camp. And now that she's finally owned up to it - come out of the closet, so to speak - she's produced her best LP ever. Gone, long gone (well, almost) is the Kim of the chirpily innocious pop-rock 45 - there's no "Kids in America"-style blandness here.No, Kim for '86 is a combination of "Love blonde"-era sultriness, Sixties girl-singer wailing and an utter lack of humour - in other words, camper than Barry Island, and a million times more fun. Some classic themes are given the full works: on "She hasn't got time for you", Kim consoles a mistreated swain, and the Gogi Grant throb in her voice alone is worth the price of admission. "Missing" - which contains the lines "It's cold in the streets/there's a cold in her nose" - is a gorgeous, scorching ballad of the sort Kathy Kirby would have given gher eye-teeth to cover.In fact, side two in its entirity could have been airlifted directly from 1962, when a song was a song and, as such, afforded properly melodramatic treatment. Her voice is remarkably similar, in its timbre and pitch, to Marie Osmond's - both embody a tenderness and poignancy that has never been critically acknowledged. The difference, though, is that Kim sounds slightly huskier, grittier - as though she's experienced adult delights like black coffee and night buses. She's an anachronism, in a way... but how nice that she's around in 1986.